In Cambodia, A Crackdown On Independent Media Threatens A Respected Daily : Parallels The government has told the English-language Cambodia Daily it must pay a $6.3 million tax bill by Sept. 4. The paper has long been a thorn in Prime Minister Hun Sen's side. Cambodia's Prime Minister Hun Sen speaks to garment workers during a visit to a factory outside Phnom Penh on Aug. 30. His government has slapped the English-language Cambodia Daily with a $6.3 million tax bill and ordered it to pay by Sept. 4. If it doesn't, Hun Sen said, it should "pack up and go." A respected English-language newspaper in Cambodia may close because it won't be able to pay an enormous tax bill the government claims it owes by Sept. 4. The Cambodia Daily was slapped with a $6.3 million tax bill last month, after Prime Minister Hun Sen ordered an investigation into private organizations operating in the country. The paper, founded in 1993, was given the deadline to come up with the millions the government said it owed from back taxes accrued over the last 10 years. Hun Sen has publicly called The Daily "a thief" and said last month if it can't come up with the money, it should "pack up and go." "I am very afraid that the paper will fold, we can't pay the tax bill," Jodie DeJonge, the editor in chief, tells NPR. The paper and its deputy publisher, Deborah Krisher-Steele, daughter of the paper's founder Bernard Krisher, say there's no justification for the amount the government says is owed and have requested a formal audit. They and others argue that Hun Sen is trying to stifle dissent ahead of the general elections next year. "The government is really afraid going into next year's election to allow those dissenting voices," says DeJonge. Human rights advocates expressed strong concern over the government's action. "The Cambodia Daily has served as an important mainstay of independent news and objective criticism for 25 years even as the government's tolerance for critical views has markedly declined," said Phil Robertson, deputy Asia director at Human Rights Watch. "Closing the Daily would be a devastating blow to freedom of the press that would have an impact well beyond the paper's readership." 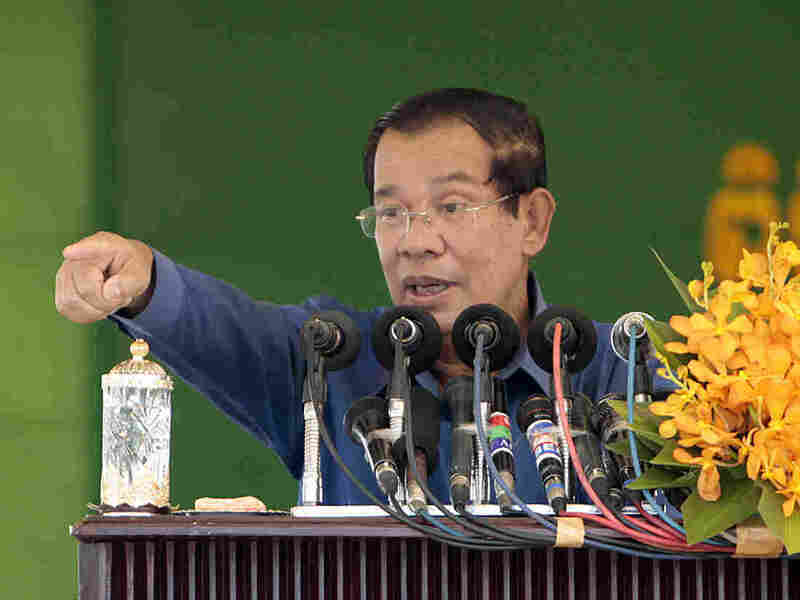 Hun Sen, a former Khmer Rouge commander, has kept a tight grip on power for some 30 years. But when the opposition party did better than expected during local elections in June, Hun Sen ramped up his rhetoric against dissenters and cracked down on the media. The government last month also ordered the U.S.-funded National Democratic Institute to close. Meanwhile, the government has also gone after Cambodian radio stations, and sent tax notices to the Khmer-language arms of Radio Free Asia and Voice of America. John F. Lansing, the CEO of the Board of Broadcasting Governors, which oversees Radio Free Asia and Voice of America, released a statement calling the developments "disturbing" and "part of a pattern of intimidation and harassment of independent news sources that coincides with the run to the 2018 elections." Lansing called on the Cambodian government "to reverse this decision to muzzle objective sources of news and to allow all impacted stations to resume normal operations immediately." This is not the first time Hun Sen has harassed the media. The Cambodia Daily has long been a thorn in his side. With a motto of providing "All the News Without Fear or Favor," the newspaper has garnered a reputation for holding the government's feet to the fire and producing dogged investigative journalism on subjects ranging from human rights to illegal timber trade. At a time when Cambodia was emerging from decades of violence, the staff wanted the paper to be a reliable source of news, especially when it came to reporting what the government was doing, says Gretchen Peters, a former managing editor who worked at the Daily from 1994 to 1996. "When I was there, we tried to remain neutral and to report both sides of the story," she says. They used the paper as a training ground to teach Cambodian journalists to do the same, says Peters. Today, The Cambodia Daily's circulation is just under 5,000 but its website has a global reach. With an editorial staff of about 30, the paper publishes in both English and Khmer. That has been crucial to spreading information, says former Daily journalist Sisovann Pin. He worked for the paper between 1993 and 2008 and started the practice of publishing a Khmer-language section. "The Daily is important for independent news for the older generation that doesn't understand English, and for the younger generation [who can speak English] so they can learn news," says Pin. He says if the Daily were to shut down, it would be a big loss for the Cambodian people. "We'd backtrack to dictatorship," he says. The current crackdown is the worst the paper has ever seen, he adds. Cambodia is not the only country in the region to crack down recently on dissent and the press. Steven Butler, the Asia program director for the Committee to Protect Journalists, says it is a time of "depressed free expression" in Southeast Asia, though the reasons for this differ from country to country. "I think China has become a proselytizer," he says, pointing out that China's severe controls of the press and the Internet probably has some influence and may be seen as a model for how to curtail dissent. The United States may also be partly to blame, says Butler. Since President Trump came to office, "What's happening is that the United States is not speaking with the same voice in favor of press freedom and human rights," he says. He warns this is creating an atmosphere in which governments are feeling more empowered to take action against dissenters and the media.